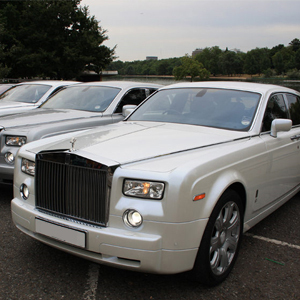 The Rolls Royce Phantom in white is definitely a chauffeur driven hire car with style and luxury and the perfect choice for a wedding in Essex. 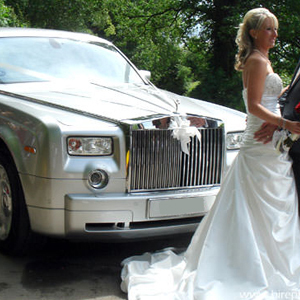 Stunning in white its the perfect way to arrive in style as you step out at your Essex venue, or even as you drive away, newly married and about to start your life together, what better way to do it than in a Rolls Royce. 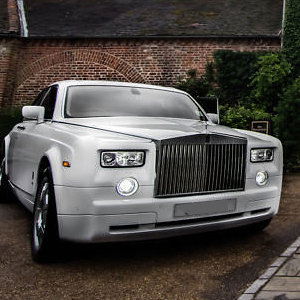 Whether its a traditional wedding, contemporary, civil partnership or an Asian wedding this car is perfect for making a grand entrance. This car would also make an excellent prom hire car for students in Essex, with its luxury look and feel and plenty of space for the flamboyant dresses you wont be disappointed with the style and elegance involved in this car, you're bound to make a grand entrance and be the envy of all your friends.